Win: Dendy Direct - Choose your own adventure | SWITCH. Not sure what you feel like watching? Dendy Direct has the answer. With a huge selection of films and television series, there's always something to take your fancy - and we're giving you the chance to win a $20 Dendy Direct gift card to let you choose your own adventure. See the latest films in the comfort of your own home, including ‘Spider-Man: Homecoming’, ‘The Beguiled’, ‘My Cousin Rachel’ and ‘Wonder Woman’. Or if you'd prefer, catch up on great classics like ‘Black Swan’, ‘The King And I’, ‘Braveheart’ and ‘Butch Cassidy And The Sundance Kid’. 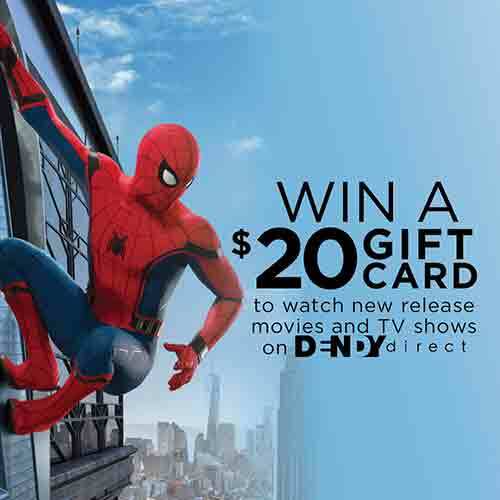 The 'Dendy Direct $20 Gift Card' competition has now closed. Winners will be announced shortly. Competition opens at 5pm AEDT on Sunday 8th October 2017 and closes at 11:59pm AEDT on Sunday 15th October 2017. Ten winners will be chosen at random on Monday 16th October 2017. To successfully win, entrants must fulfil the above entry conditions before the time the competition closes. Current members/followers are eligible to enter the competition. Only one entry per person. Only one winner per household. To be a valid winner, the entrant must not have won a prize from SWITCH within the last 28 days. Each winner will receive one Dendy Direct $20 Gift Card. By entering, you agree to receive occasional emails from SWITCH in the future. If you decide to unsubscribe from these updates, any further entries will not be applicable. Only Australian residents are eligible to enter.